Honky-Tonk, Barroom, Powerpop to drink beer and dance to. Of course I know who Carla Olson is but her 80’s band the Textones are whole new adventure for me; and boy do I wish I’d seen them live in their heydays. Debut album Midnight Mission still fires on all cylinders 30+ years after it’s original release. Opening track Standing in the Line took me instantly by surprise as it sounds like a cross between early Blondie and Chrissie Hynd’es The Pretenders. For once in our lives, my beloved wife agreed with me! The whole album is full of Punk and whisky fuelled pop tunes and power chords; that were all the rage at the time; but the songs themselves and Olson’s superb voice take the band to a whole other level. I love the juxtaposition of several songs; especially Hands of a Working Man, which sounds like the Runaways singing Springsteen and Luck Don’t Last Forever could be Suzi Quatro fronting the Clash with the Rumour’s horn section in the background – seriously. We can’t ignore the ‘rare’ Dylan cut Clean Cut Kid; which His Bobness donated after Olson appeared in one of his videos. This may be sacrilegious but alongside The Textones original work it actually sounds a bit ordinary and pedestrian. This album comes with five ‘bonus tracks’ including an excellent ‘alternate take’ of Number One is to Survive and two live tracks Running and No Love in You, both of which had me designing a machine to travel back in time. By the time this was released the band had gone through a couple of personnel changes but also hundreds of gigs; honing their sound which had ditched it’s Punk roots and gone full on E-Street Band meets Cheap Trick but with a sassy lady singer. Perhaps it’s a case of ‘right place at the right time’ but I recently had this album blaring out of my car speakers on a hot and sunny day and I was instantly transported to the LA Freeway in a red Corvette instead of the A1(M) in my Laguna Estate. Opening track Not Afraid is a ballsy Rock n Roll song that sounds as exciting today in 2015 as it must have done in 1987 and is followed by another two that hit the ground running and don’t look back. The band has certainly evolved with Olson and George Callin’s twin guitars taking away the reliance on her vocals; which are still as good ever, btw. Perhaps a more ‘complete’ album; than the debut Tom Junior Morgan’s sax playing becomes a regal signature throughout and the legendary Ian ‘Mac’ McLagan makes a guest appearance on the down and dirty title track as well as You Can Run which is probably the highlight of both albums. The original release only had 9 tracks so an 8 song live set from The Catalyst in Santa Cruz has been included and boy – what a doozy that night sounds like! Ahead of their times? A product of their times? 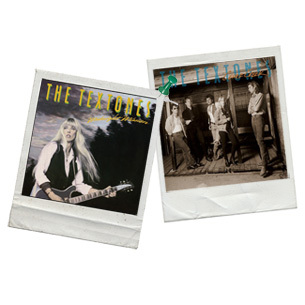 It’s something to discuss; but unlike a lot of over-produced albums from this era that haven’t stood the test of time these two Textones albums will get a lot of play on my car stereo this Summer and many Summers to come.